We got swept up in the colour run fad back in 2012, and we've been at it ever since! Every May, celebrate running in Kitchener-Waterloo with In Running Colour. The 6th annual In Running Colour will go May 26 at Columbia Lake. Join us and support Special Olympics Ontario Kitchener-Waterloo. What makes this colour run special? It is locally organized and all funds stay in Waterloo Region to help fund running initiatives and Special Olympics. All participants will receive a white race t-shirt for maximum colour exposure, plus colour packs and Run Waterloo novelty sunglasses. Individual. Runners receive a t-shirt, sunglasses, and two colour packets. Price includes tax. This event is not timed. Individual. 12 and under (and parents/guardians!). Runners receive a t-shirt, sunglasses, and two colour packets. Price includes tax. This event is not timed. This event is part of Run Waterloo's Run Plus series. These events are truly running events, but with a twist. Whether it's pancakes, colour or a Santa suit, this plus experience makes these runs fun and fresh. Explore all Run Plus events. Mail in: To 2 Weberlyn Crescent, Conestogo N0B 1N0 by Tuesday May 22 at 5:00 p.m.
Drop off: At Runners’ Choice, 55 Erb St E, Waterloo by Tuesday May 22 at 5:00 p.m.
Online: Right here at www.RaceRoster.com by Friday May 25 at 12:00 noon. Columbia Lake (field behind OpenText), Saturday May 26, 8:00 a.m. - 9:30 a.m.
You can earn a FREE ENTRY by raising $100 in pledges! It's easy; see below for more information! All participants will receive a white cotton race t-shirt which should be worn during the race for maximum colour exposure! 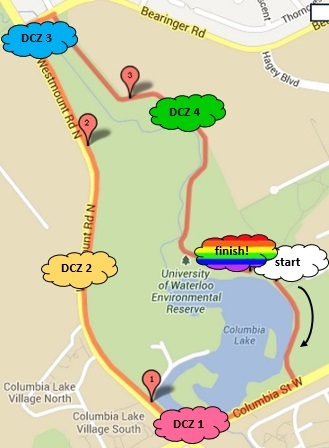 In the Designated Colour Zones (DCZ), all participants will be blitzed with a series of colours. Each participant will receive an individual packet of colour for their own individual use, and a pair of sunglasses. Feel free to bring goggles or anything else you feel necessary! Additional colour packets will be available for sale to bombard your friends! After the 4 KM, all participants will have the opportunity to watch the 1 KM event for kids! Proceeds and pledges from In Running Colour will go to support Special Olympics Ontario Kitchener-Waterloo. Signing up and running helps out, but please also consider collecting pledges! Every participant who raises a minimum of $100 gets a full entry fee refund. The top pledge raiser wins a BBQ! 1. All runners have their own online page to securely raise money. 2. To collect pledges in-person (with cash or cheque), a paper form is available. From Hwy 401 take exit 278 (from Toronto) or exit 278B (from London) to Hwy 8 West Kitchener. Exit at Hwy 85 Waterloo. Exit at University Ave. West (second University Ave. exit). Turn right at Weber Street North. Turn left at Columbia Street West. Turn right at Hagey Boulevard at the University of Waterloo. The 4 KM and 1 KM events are not timed races, and the courses are not certified distances. There will be one water station on the 4 KM on the course. Each KM will be marked. Courses are subject to change pending approval and external factors. Starting at the the west shore of Columbia Lake, run south on the Trans Canada Trail to Columbia St. W.
Turn right onto Columbia St. W.
Turn right onto Westmount Rd. N.
Turn right onto Bearinger Rd. Turn right onto the Trans Canada Trail. Run South to the Start/Finish line! Starting at the Start/Finish venue, the 1 KM will follow a 1 KM route around the field. Parents are encouraged to run the 1 KM with their children. If you have already registered for (and run) the 4 KM, then don't register again. Otherwise, parents are welcome to register for the 1 KM. There is no timing or awards at this event. Participation is strictly for fun and colour! Enjoy musical entertainment, a group celebration of colour (see photo above) and a variety of refreshments following your run. 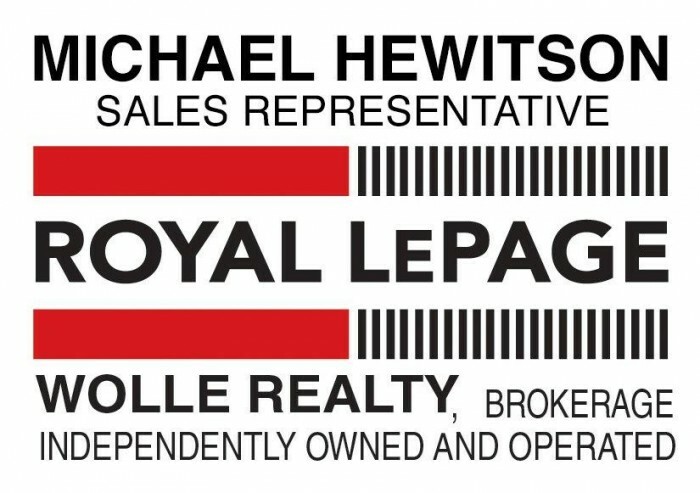 The sponsors recognized on this page have generously contributed financial support, products and/or services to In Running Colour and we encourage your ongoing support of these generous companies and organizations. Thanks to all of our sponsors for making this event possible!